The opportunity to join Equanimity doesn’t come around very often. Here, it’s difficult to get in, easy to leave. Now may be your chance to join the household. On the ground floor there are 3 cosy, furnished rooms that includes a king single or double bed, desk and wardrobe/storage… there’s a shared kitchen/dining/laundry, separate toilet and shower room and outside there are furnished decks. All utilities & Internet are included in an arrangement with a suitable person. Rent is between $160 – $170. It best suits someone who wants to be part of a food-producing household and shares a common interest in caring for things, people and the environment. Enterprise and efficiency is encouraged. Our democraphic is diverse; queer friendly and inter-generational. Aesthetics, systems and friendliness matter. Think of us as a micro economy using LETS Units. It’s in a quiet suburb in a modern reproduction Queenslander home with an 8-star sustainability rating. For more information, please see the Visitors page and the post on using LETS at home. It’s on bus routes 120,199, 123, 125, 135, 155 & 598/599. 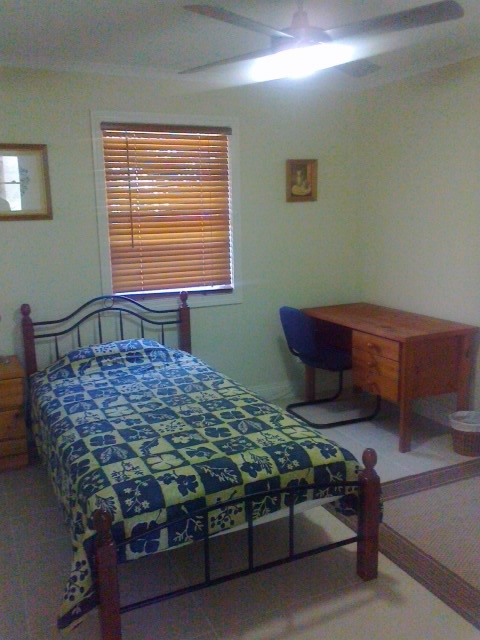 Walking distance to local shops and QEII hospital, between Griffith University Nathan campus and Coopers Plains station. Send a profile to Simon through the contact page. This entry was posted on September 13, 2015 by Equanimity Foundation.